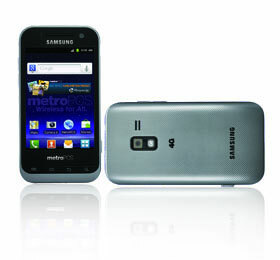 Recently, the Samsung Galaxy Attain 4g was released for MetroPCS. It’s a Google Android phone that uses Android 2.3 (Gingerbread) and uses the 4GLTE network. 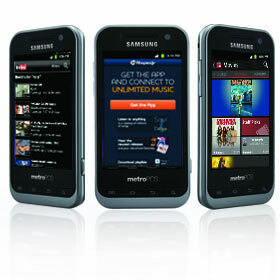 The Samsung Galaxy Attain 4G sports a beautiful 3.5″ touchscreen for displaying not only pictures, but videos as well. This screen has a resolution of 320 x 480 pixels and uses TFF QVGA. Want to play music through the Samsung Galaxy Attain 4G? No worries! It has a music player that can play files such as MP3s and even supports music streaming. As for the video player, it supports 3GP, ASF, AVI, FLV, MKV, MP4, and WMV file extensions and even streaming videos. Adobe flash files can be viewed too. For music, you can purchase a Rhapsody Unlimited Music plan. Bored? You can also watch YouTube videos! The Samsung Galaxy Attain 4G needs to be able to compete with other modern phones…and so it sports the usual connectivity options you would expect. It has Bluetooth wireless capabilities, Wi-Fi support, and GPS. Wonder what kind of bands are supported? Well, it has network support for PCS 1900, AWS 1700/2100MHz and LTE/EVDO Rev0. Battery life on the Samsung Galaxy Attain 4G is average. The battery holds 1650mAh, which supports up to 200 hours of talk time. That’s 0.14 days of standby time. Extended batteries exist though which help to increase the overall time. The weight and size of the phone are what you’d pretty much expect. It weighs at just 4.2 Ounces — so it isn’t heavy — and althought it isn’t huge in size, it isn’t ultra thin either. The dimensions are 4.57″ x 2.38″ x 0.46″. As commonly seen with modern phones, this Smartphone has not one but TWO cameras. A front-facing 1.3mp camera and a rear-facing 3.0 megapixel camera. It has auto-focusing capabilities with several shot modes such as smile shot, panorama, action shot, cartoon, and more. This camera also has Geo-tagging for tracking where you are when taking the picture, as well as a camcorder for HD Playback. You can also share videos easily and upload them online without a problem. Wonder how fast the Samsung Galaxy Attain 4G is? Well, this phone has a processor rated at 1GHz. Apps often come out to overclock this. Run out of memory on this phone from all the apps, videos, music, and pictures you have on it? Good news! It has expandable memory support. Just add a microSD card. It supports cards up to 32gb’s. Like the Apple iPhone, this smartphone sports an accelerometer. It has multitasking capabilities, as well as nice social networking capabilities that exercise Facebook and Twitter. You can check your email, instant message (IM) on AIM / AOL and other messengers. You can text message via the virtual on-screen keyboard, and you can easily close apps using Task Manager. This entry was posted	on Thursday, February 2nd, 2012 at 9:30 PM	and is filed under . You can follow any responses to this entry through the RSS 2.0 feed. You can leave a response, or trackback from your own site. Bought this phone 8 days ago. Returned it yesterday because the battery wouldn’t its charge more than 2 hrs, even though I was not using it. Today, the new battery lasted 3 hours (on standby only). Do I need to rate this phone? Thumb down. I bought the SCH-R920 Galaxy Attain a few months ago. I dont kno if it is just my phone, but every now and then it blacks out. Not to mention that the music player app leaves much to be desired, for it does not play the songs to their full length. Its a great smart phone. It does everything I need it to do at a good speed! No crashing. Well SCH-R920 that I bought about 7 months ago, keeps freezing, battery life very very low, no 200 talk hrs, Keeps saying memory low when I but a big sd card, Got rid alot of my apps. It says it has 1.23gb memory on phone but it keeps freezing because memory full. I keep it because can’t really afford another phone right now but when I get the chance out!. The battery life is ridiculously LOW!!! I even brought an extended battery, can only get 7hrs in standby mode & 2 hrs on a full battery. The 200 hrs is FALSE ADVERTISEMENT!!! I also bought this 3 weeks ago, and damn it always blacks out and keeps on crashing , don’t buy this stupid phone from metro pcs.